First, I am going to warn you…this might be long and it might be all over the board! Apparently, I have either been lazy or busy because I haven’t blogged in nearly two weeks. TWO WEEKS?!?! Oops, sorry. Well, sorry to those who care and to those who actually like to read what I write! So, what’s been happening the last couple of weeks? Well, not much. I was sick. I didn’t run. I felt a little better. I ran. My asthma acted up. I didn’t run. My motivation got lost somewhere. I ran a virtual 5K. My eating has been mostly good – I did have a couple of pig out days, but I’m over them. No guilt. No cares. No worries. My brother visited. My sister and her family visited. I worked. I ate. I slept (or tried to). I got a new pillow. I slept better. I watched some movies. I may have signed up for some races. I attended some fitness classes. I didn’t attend some fitness classes. Well, I guess it won’t be a long post. That’s it. That’s about all I’ve been up to the last couple of weeks! Okay, so I am kidding, I’m not done. Instead, I am going to highlight a few of the things I previously mentioned. 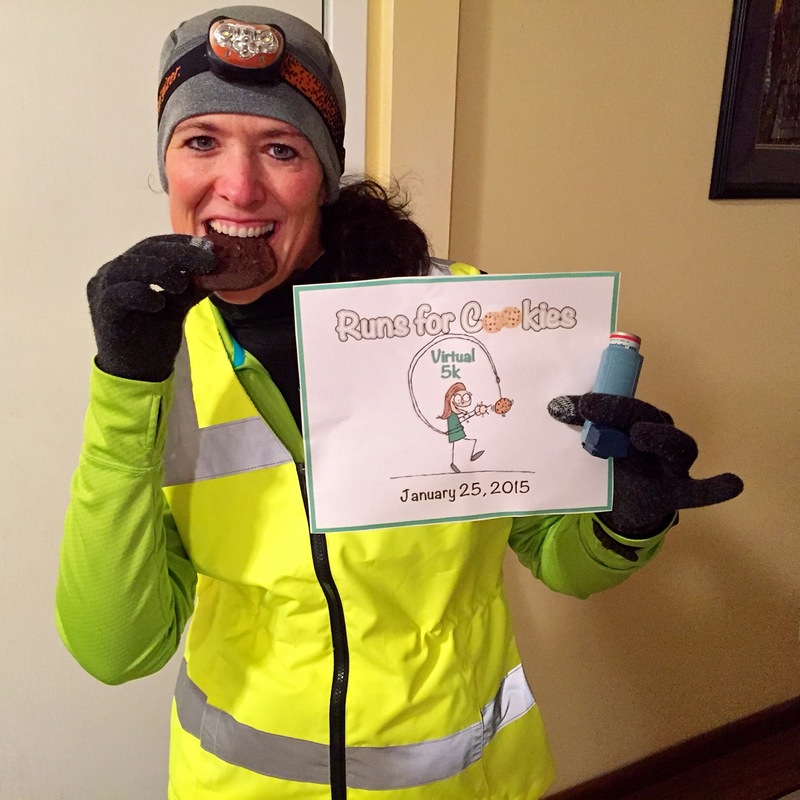 So, last Sunday, it was Katie’s – from Runs for Cookies – birthday. She turned 33. 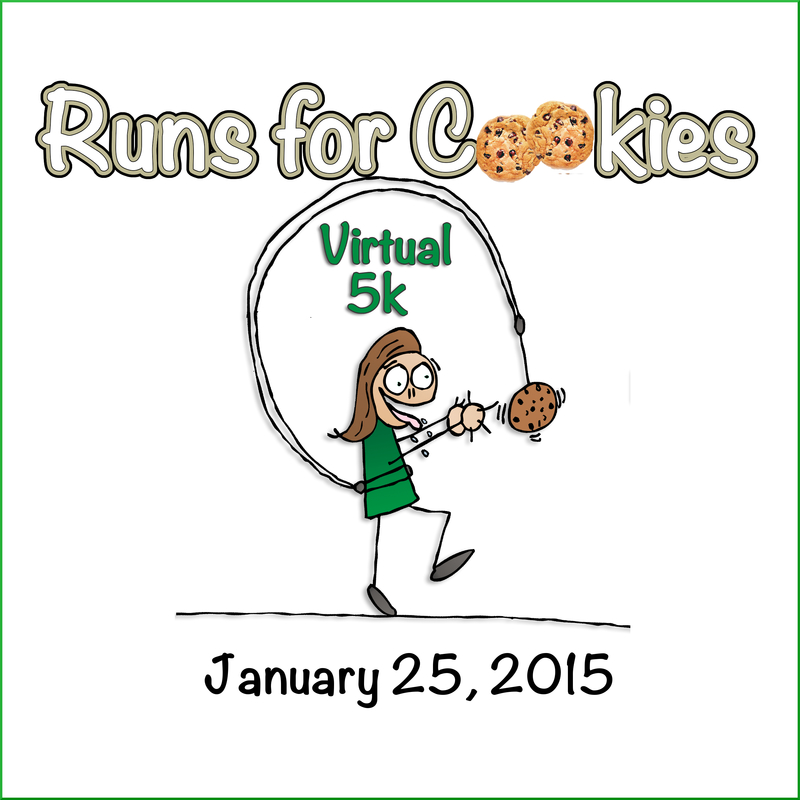 And, in honor of her birthday, she invited her readers to join her for the 3rd annual Runs for Cookies Virtual 5K. Before I tell you about it, I just need to say again, even though I know I have told you all before, Katie is by far, my favorite blogger I don’t know. Meaning, I have a couple of friends who are bloggers and I love their blogs, but I don’t “know” Katie. I’ve never met her, although one day I will. Katie’s daily blog (one day, I will be a daily blogger!) is so motivational, inspirational and informational to me. I love her writing style. I love her tell-it-like-it-is manner. I love her genuineness. Her realness. I love her personality. I love her story. I just love her. Period. You can check out her blog HERE and her Facebook page HERE. Happy Birthday again, Katie! Hope it was a great one. Anyway, I signed up to do her 5K on Sunday and as with most Sunday’s, I was lazy. I watched lots of television and I may have even taken a nap. 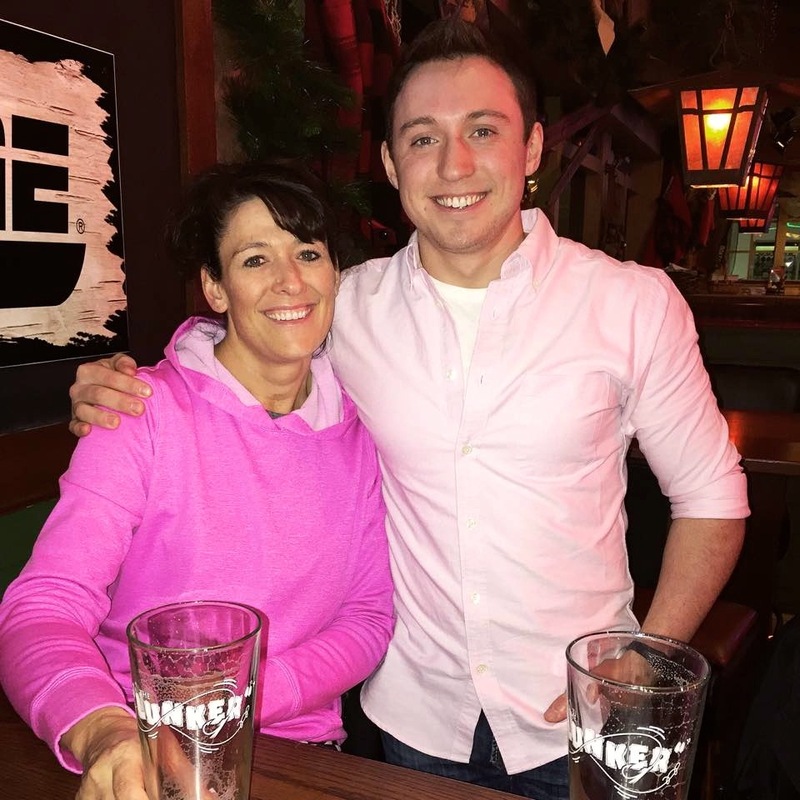 As the evening – more specifically, darkness – was nearing, I finally decided to get up off my duff and go out for my 5K run in honor of Katie. It wasn’t too bad weather-wise. The temp was about 25ºF and there was a slight breeze. If I would have ran before the sun went down, I am thinking it would have been lot nicer. But, by the time I got out there, the sun was pretty much gone and I had to wear my headlamp! AND…it felt cold and damp. I wanted to try and get the run done rather quickly because of course, I hadn’t gotten enough television time in, and so when I started, I started way faster than what I usually do. Way faster. And by about mile one, I was sucking air. Literally. And because I couldn’t catch my breath – and because of the cold and dampish weather – I kind of started to panic and because I panicked, my asthma decided to rear its ugly head. I have been using Young Living Essential Oils to help with the cold/sore throat/sinus headache I had and for my asthma, but I hadn’t used them that day. (I will post another day about my experiences with Young Living Essential Oils.) Anyway, I ended up calling my son to bring me my inhaler. I also had to start walking to try and get my breathing under control, which in a way didn’t help because it made me somewhat mad and not calm. Oh well, you got to do what you got to do! When Brandon got to me, he asked if I needed a ride home, but I took a couple of puffs of my inhaler and really tried to calm myself down and breathe slowly and deeply and that seemed to help. I thanked him for the offer and sent him on his way. (By the way, thanks again, Brandon, for bringing me my inhaler!) I did eventually start running again and I made my way home. I ended up running the 5K in a little over 37 minutes, which is not bad considering I walked a good junk of it! All that really mattered was that I did it and I completed the 3.1 miles. I have a confession to make to all my Weight Watchers members…I haven’t tracked – REALLY tracked – since before Christmas. I do really well for a day or two and then, I just stop, for whatever reason. With that in mind, my weight hasn’t gone crazy. It’s pretty much stayed the same. I did have a slight gain over the holidays, but by about the second week of January, it was back to “normal” or what I considered normal and a number I am happy with, as in under 145!. For the past few weeks, it’s stayed about the same. I do have to say, that I have now kind of adopted an 80/20 rule. I eat healthy with reasonable “normal” portions 80 percent of the time and I don’t eat as healthy and my portions might be slightly bigger the other 20 percent of the time. The key – at least for me – is to stay active! I move, meaning workout somehow, most days. I try to average at least 10,000 steps a day and I get on average, between 6-10 activity points per day (WW members will understand this!). It really truly is about staying active and eating right – MOST of the time. If you don’t have that balance, it’s hard to maintain. I have read numerous times that you can’t out exercise a bad diet and that is SO TRUE! As many of you know, my hubby is a super-duper cook and we’ve had some really, really, really good meals lately. I have taken pics of some and I’ve forgotten or didn’t feel like taken pics of others (because I feel that people get sick of me posting food pics!). A couple of nights ago, we had some terrific burritos that my husband made from the leftover pork carnitas. Pork carnitas is basically slow cooked Mexican-inspired pulled pork. When he first made it, he used it on homemade grilled pizzas. 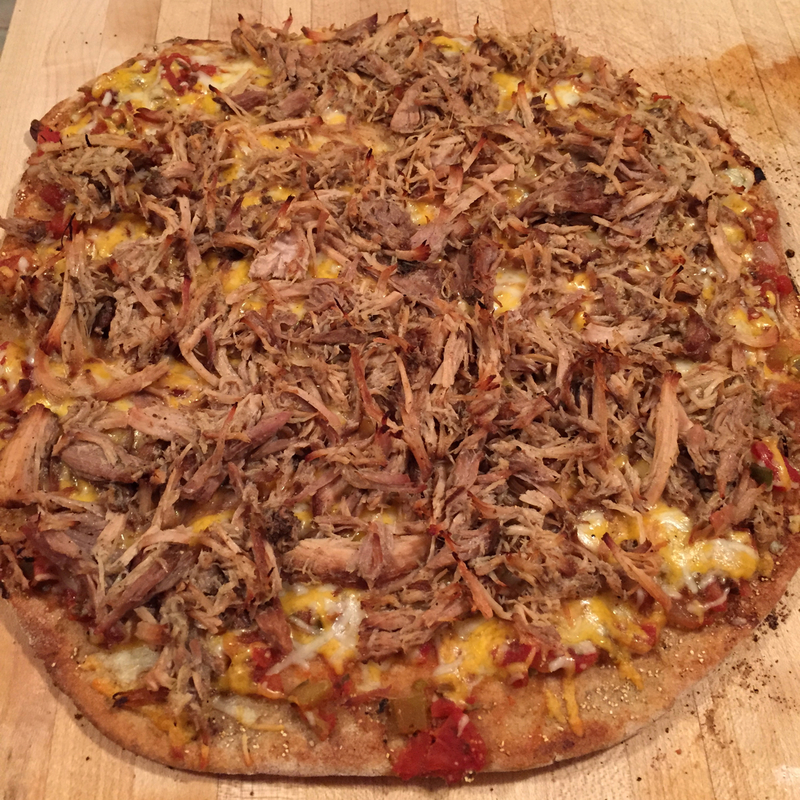 I don’t have the actual recipe for the pizzas because we made them up ourselves, but CLICK HERE for the recipe for the pork carnitas. Here are the two pizzas we made. And no, we didn’t eat it all in one sitting. We had some Saturday night and then we had it for supper a few nights later. The crusts for both pizzas were the same – a homemade whole wheat crust. The pizzas were both cooked on the grill. 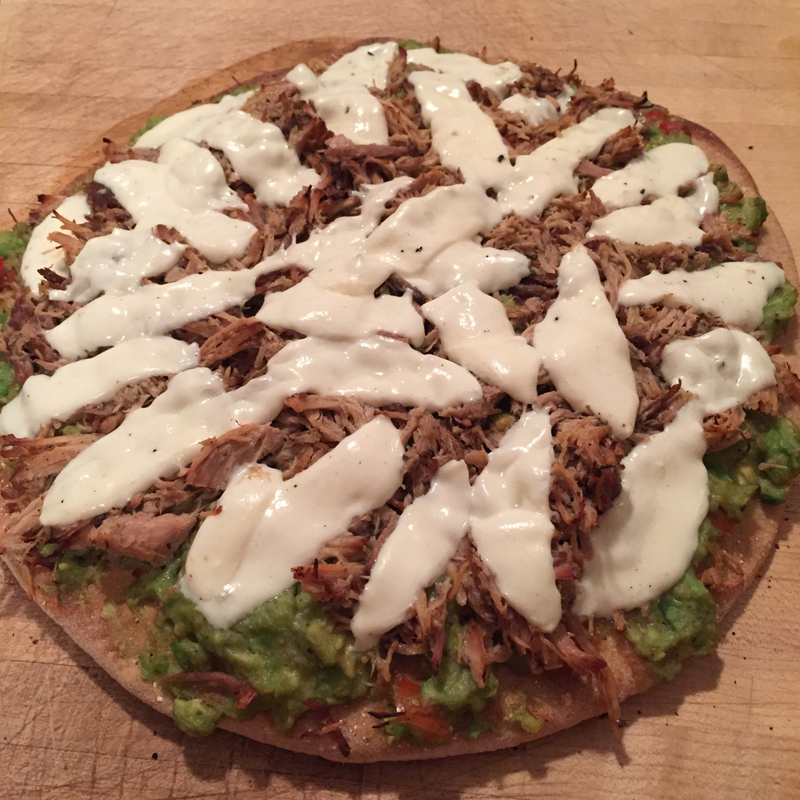 This pizza had homemade guacamole for the sauce, the pork carnitas and then fresh mozzarella cheese on top. That’s all. This pizza had salsa for the sauce, shredded Mexican jack cheese and then the pork carnitas. Yes, we put the cheese UNDER the meat! Both pizzas were SO delicious. I really couldn’t choose which one I liked best. Seriously, there were SO GOOD! 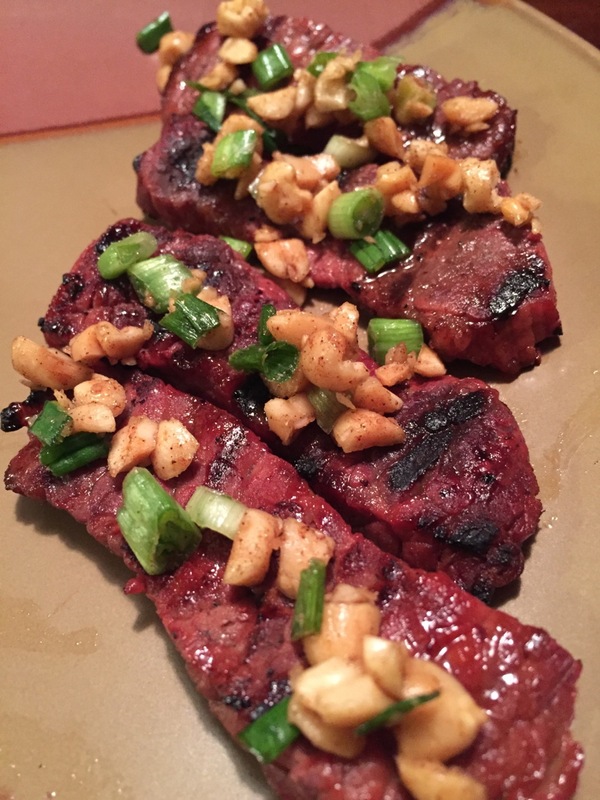 Another recent meal that was beyond good was the orange-ginger grilled boneless short ribs with green-onion-peanut relish. Yes, that was the actual name of it. Really? Yes, really. 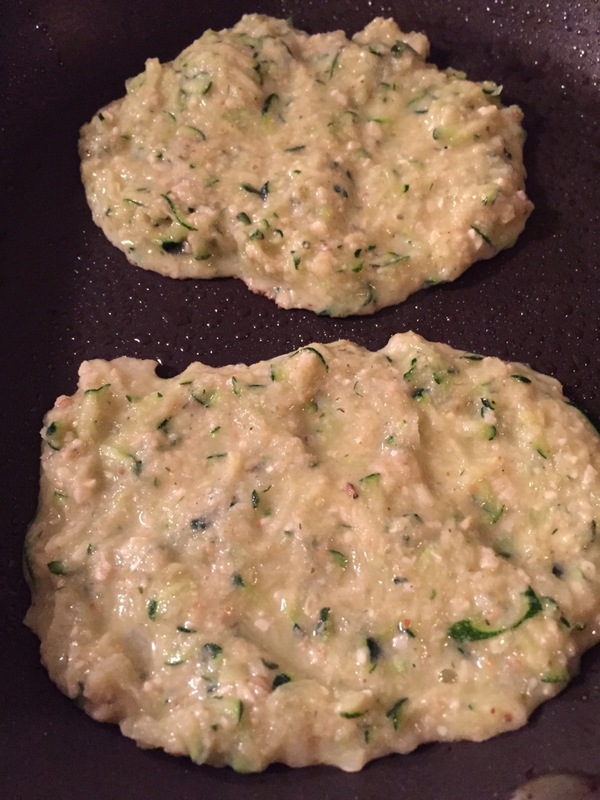 Did I ever mention that my husband loves scouring the internet to find interesting and fun recipes. Well, this was definitely one of them. YUM-YUM! You can CLICK HERE for the recipe. They were SO good. I think this was maybe one of the only times where my husband finished his meal before me. I’ve never savored a meal like I did this one. So. Much. Flavor. And the meat was cooked perfectly. The side dish, on the other hand, was a complete and utter FLOP! And guess who found the recipe for that one. Yep. Me. My husband still swears, however, that he actually liked the side dish. I still swear he’s not telling the complete truth. 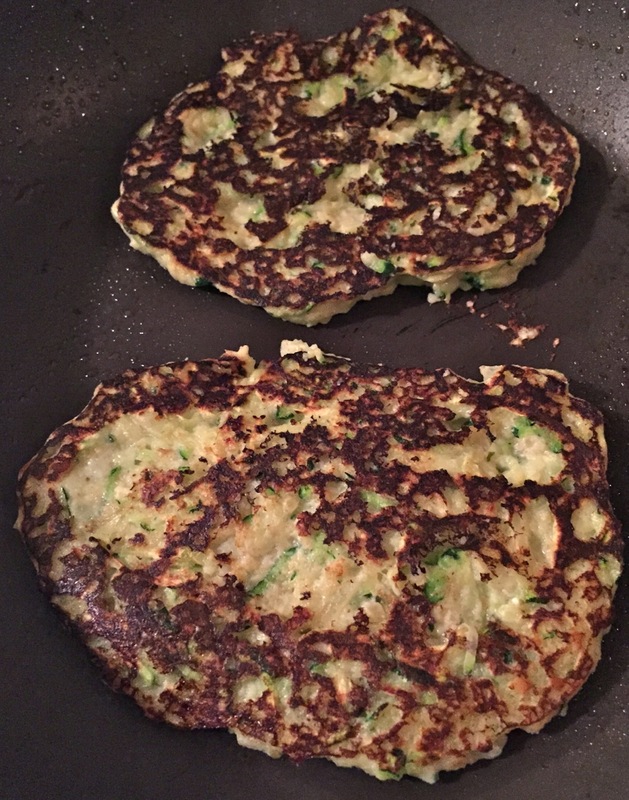 I am not sure what I did wrong, but seriously, the zucchini and pine nut pancakes were a disaster! Plain and simple. They look kind of good, right. Wrong. Again, a complete and utter FAIL! My husband and I went for a walk after we ate the pizza (previously talked about) and it was a beautiful, snowy, mild-temperatured night. 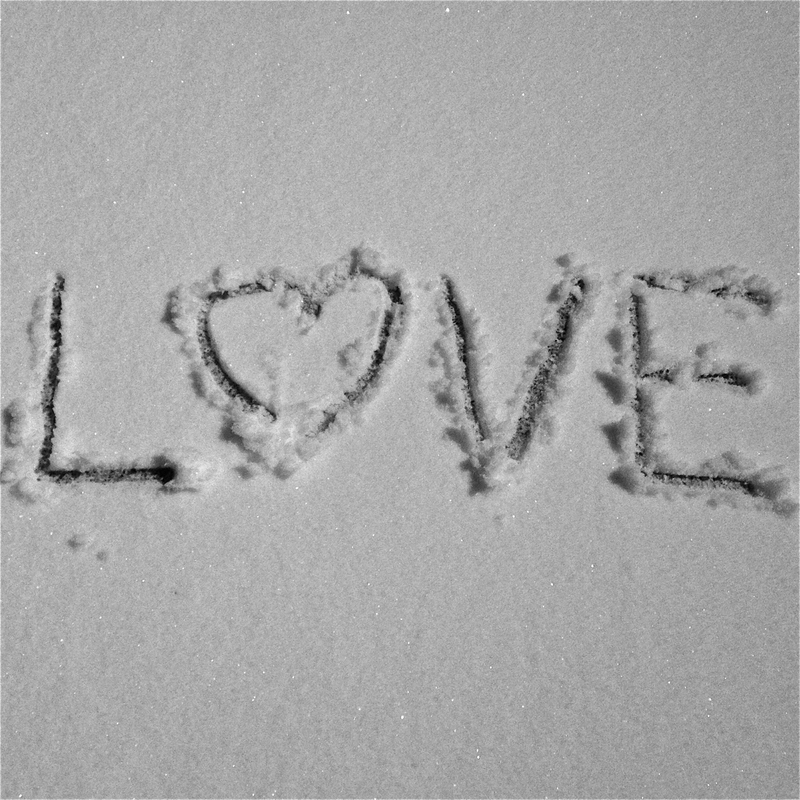 Even though I don’t LOVE winter, I LOVE my hubby and I that is why I wrote it in the snow. 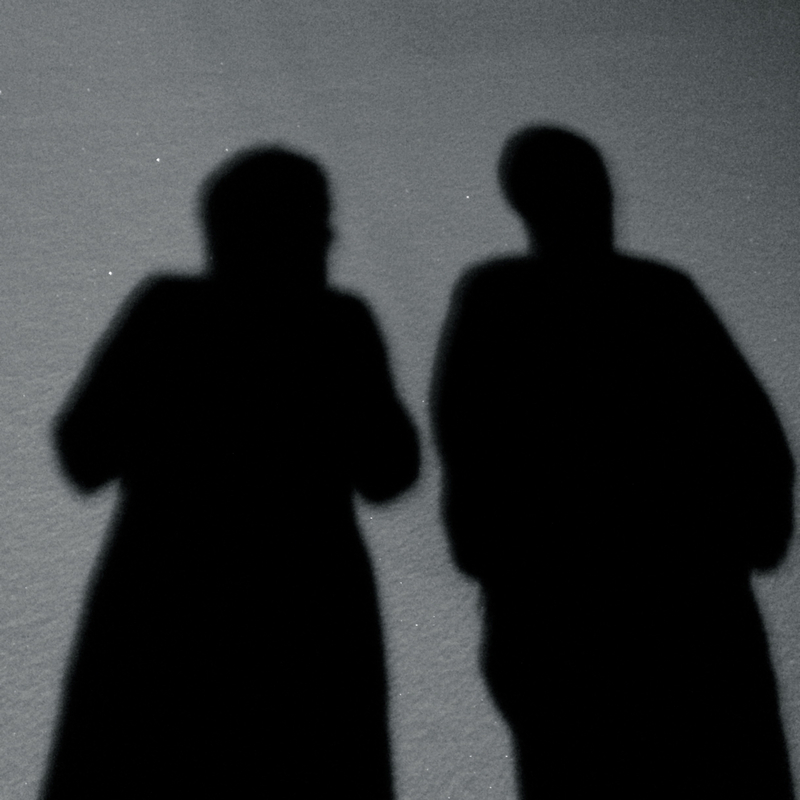 These were our shadows in the snow that same night. My hubby said we kind of resembled Mrs. Buttersworth (me) and The Oscars statue (him). 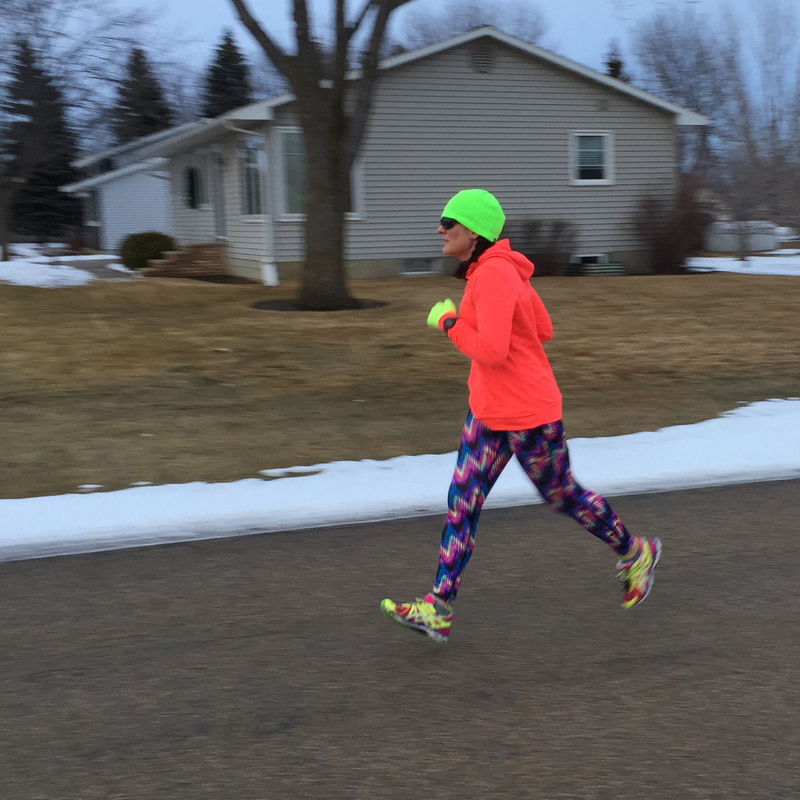 This is a neat photo my son captured while I was out running. I asked if he could take some pics because I was going to use them for something and this is one of the ones he shot. He took it using his iPhone 6 Plus. Thanks, Brandon! I kind of actually like it! And speaking of my son, the other night, he asked my hubby and I if we wanted to go out and get a beer with him. There was no way, despite how tired I was, that I was going to turn down his offer! It’s not every day that he asks us to go out with him. I’ll take every opportunity I can to spend a little time with my kid. I have to admit, though, it’s still weird that he’s old enough to go out and have a drink! We were both sporting our love of the color pink! I know I am biased and all, but dang, I kind of have a good-looking kid, don’t I? And not that it matters, I WAS sitting on a chair when this pic was taken. Although he really is probably that much taller than me! Here we are again. This time, back in 1993 or 1994. Can’t remember the year. 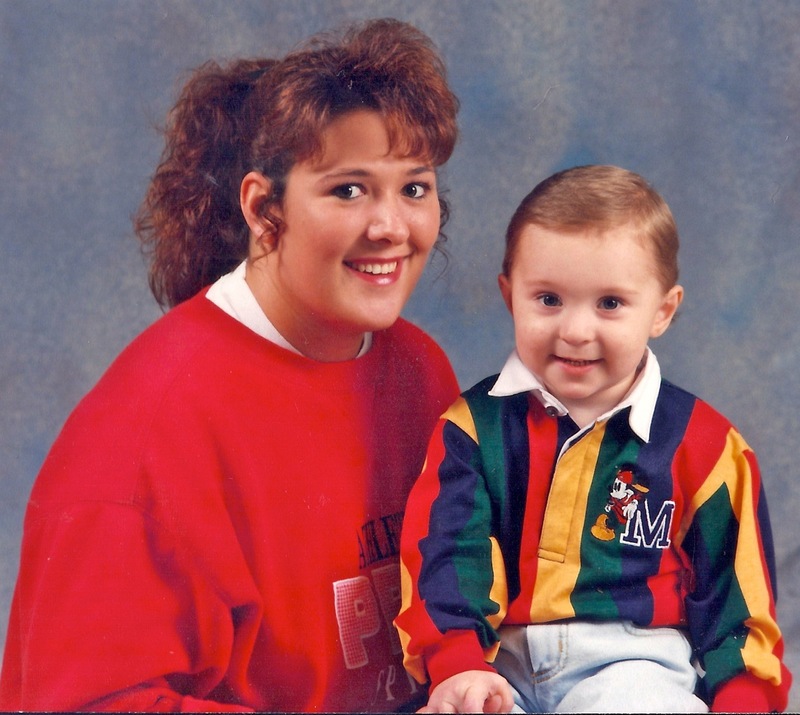 I guess we both have changed – just a little! (And no, that was not my natural hair color – I used to color it reddish. I LOVE red hair!) Isn’t he just the cutest little kid you ever did see? That smile. Those eyes. Them cheeks. Well, I guess that’s it. That’s all I got for you. Today, anyway. Make it a great one!